Sen. Kirsten Gillibrand (D., N.Y.) appeared on "The View" Monday where she criticized President Donald Trump's approach to immigration and the use of the "racist slur" "chain migration." Co-host Sonny Hostin introduced the topic by noting Gillibrand was not a fan of Senate Minority Leader Chuck Schumer's decision to end the government shutdown last week. She then asked Gillibrand if she would support Trump's immigration proposal, which includes a path to citizenship for those protected under the Deferred Action for Childhood Arrivals (DACA) program along with funding for border security and broader immigration reform. "No. 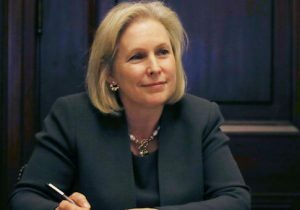 His proposal is going to really end family reunification as we know it," Gillibrand said. The senator proceeded to talk about how "Dreamers," those illegal immigrants brought to the country as children and protected under DACA, view the United States as their home. "Do you agree with Nancy Pelosi when she says Trump wants to ‘Make America White Again' and that's what this is about?" Joy Behar asked, referring to comments the House Minority Leader (D., Calif.) made Friday. Gillibrand's attack was apparently on the president's, and many others, criticism of immigration based on family ties alone, widely referred to "chain migration." The Trump administration has called for more merit based immigration in lieu of chain migration. "It is not right," Gillibrand said. "We have to change the debate."